It is getting really exciting to see this project start to build momentum. Get ready for an information packed and picture heavy post. 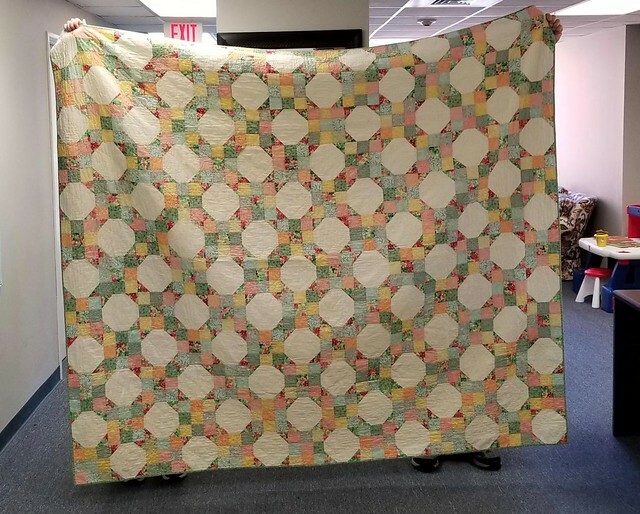 The first quilt has arrived at the Catholic Charities office!! Thank you to Shirley Graff of Milwaukee, WI!! Disaster Case Worker Leslie Ann Andreson on the left and Regional Director Emilie Hart on the right were thrilled to receive it. 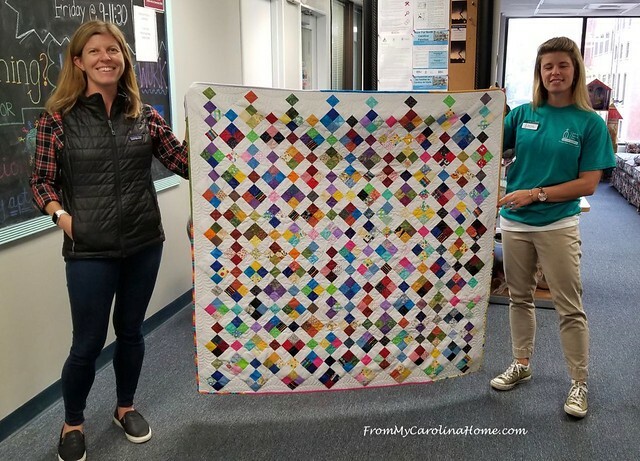 Here is the quilt with Office Manager Jo-El Sidbury Smith on the left, then Disaster Case Worker Leslie Ann Andreson, Intern M.S.W. Lena Thomas, and Regional Director Emilie Hart. I love that they sent pictures. Thank you Jo-El! 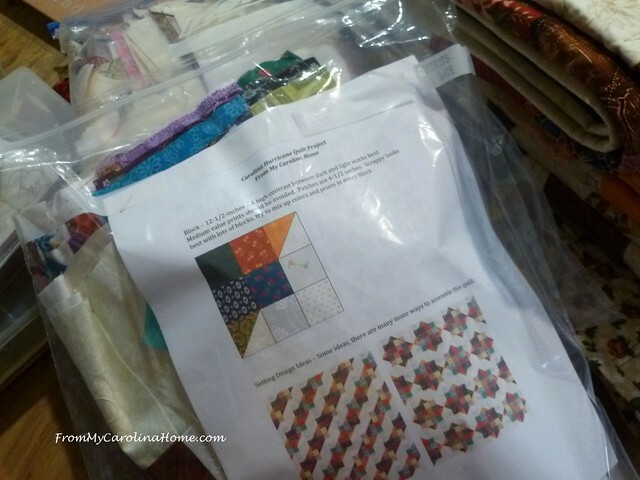 Quilt tops made by Sandy Cole are on their way to longarmers Brenda Alburl at Songbird Designs in Alabaster, Alabama and Sally Fitzgerald of Sally’s Quilting Studio in Big Bend, Wisconsin for quilting and finishing. I still have a dozen or so longarmers ready to help, and if you can provide top and backing, I’ll match you to someone for finishing. Donations are still needed to buy batting and send to some of the longarmers that do not have the ability to purchase wholesale. One of the packages arriving recently had a finished quilt inside, along with a lot of blocks. 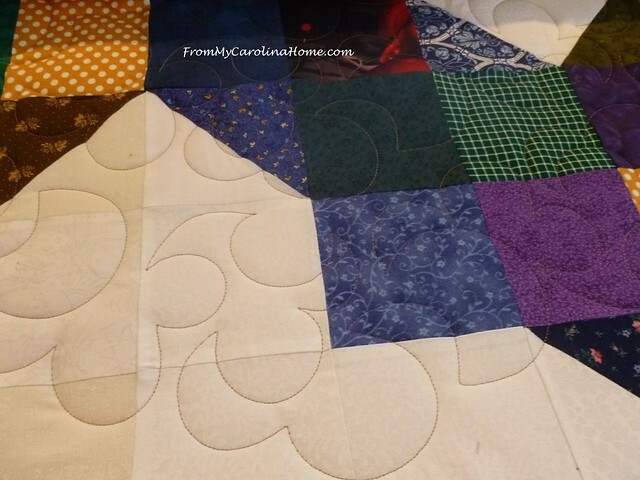 The fully finished quilt is from Carol of Yorktown, VA, and was in the box with blocks made by a group led by Linda M.
Before the holiday, I planned a sew day with a few friends. Bonnie, Bridget and Sam helped form an assembly line. We sewed blocks into doubles forming peaks, then assembled peaks into rows. 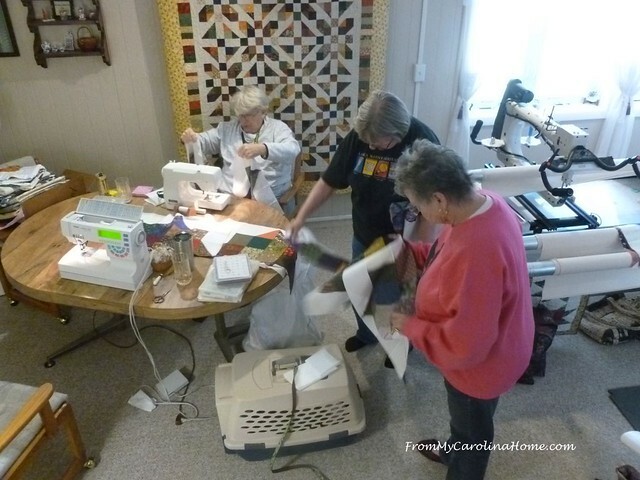 They were using my machines, as all of them needed a workout to keep them sewing well. Every one was loaded with my favorite Aurifil thread. I was on my workhorse Kenmore, assembling the rows into the top. My Aurifil thread is on a thread stand behind the machine so it feeds properly for a crosswound spool in case you are wondering, LOL! Midway through the day, the first top was assembled, and I loaded it on the longarm with a wide back from Backside Fabrics, and that marvelous Hobbs batting. At the end of the day, a second queen size topper was done, too. 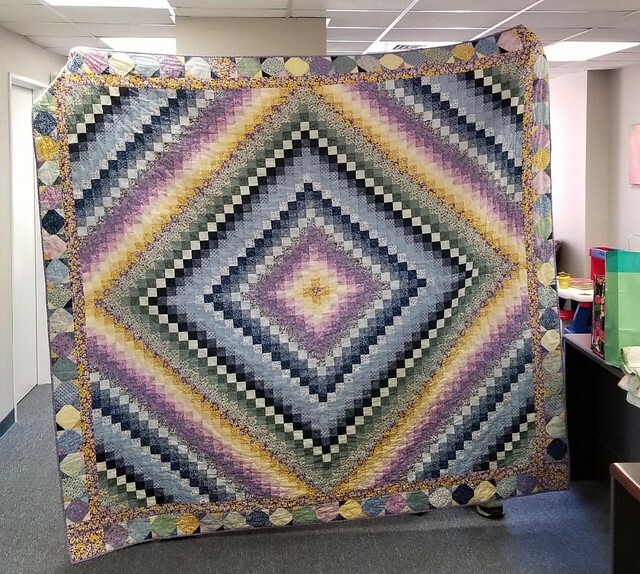 This top was delivered to longarmer friend, Chryste at Quilts on the Ridge, who is going to use the wonderful donated wide back from Backside Fabrics, along with a donation from Quilter’s Dream of a Dream Poly queen size batt. I’ll also be delivering one of the completed tops sent by readers to Rachel at Little Bird Quilting next week, as she has agreed to donate batting and quilt one as well. Thank you all!! I want to give special thanks to Kris B for her donation to help with batting, thank you so much!! Blocks were received from Melanie T and Carole L, Tracy, Karen D, Sue B, Carol H, Brenda B, Erin H, Faye B, Kathie L, Janet T, Diane H (from Canada! ), Pat E, and two with just last names from Hazel Green, Alabama and Rochester NY. I also received two packages with blocks without any return address and no notes inside, so I don’t know who to thank. In the last package received yesterday, there were a stack of blocks made by a bee in Los Altos, California including Ann D, Martha H, Frances M, Susan S, Marcelle R, Angie P, Mary W, Susie L, Sandi A Phyllis B, and Eileen W.
At this point I do not need any more blocks. I have enough now to do more than eight queen size quilts! I packaged up the extra blocks to ask more friends for their help, making up kits with setting ideas. Local quilting couple Claire and Mac are going to assemble this one. I took advantage of Black Friday and Cyber Monday sales to get really deep discounted Hobbs batting and more wide backings for the extra blocks. Here are some of those ideas for your tops, different than the ones I have shown so far. 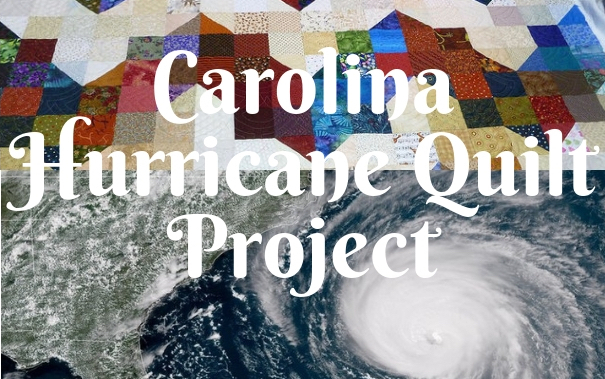 Download a PDF of the block and several setting ideas – Carolina Hurricane Quilt Project. I got to the quilting this week of the first top we put together. I decided to use a rounded pantograph that looks a bit like clouds. The top is layered with fabulous Hobbs 80/20 batting donated by Hobbs. The backing is visible at the top of the picture, and is another Backside Fabrics donation. I’m using Glide thread in the top, with Aurifil in the bobbin. I like the color, it lets the piecework colors shine and adds some wonderful pattern to the background whites. 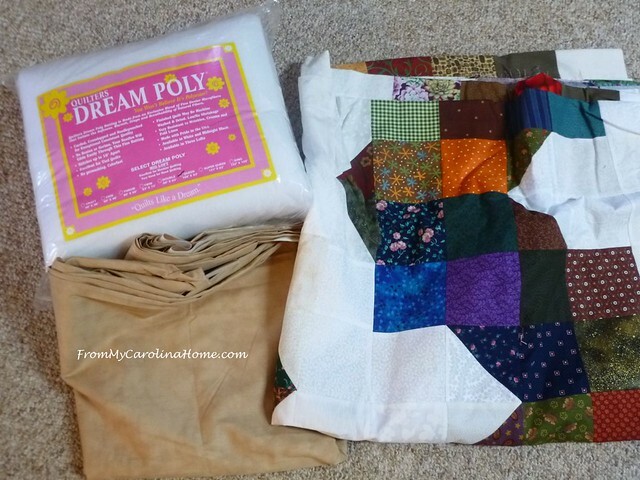 I have the Sandhill Quilters in Pinehurst NC matched up with Sallie in Wilmington who is willing to meet them in Fayetteville to transport their quilts to the distribution office. 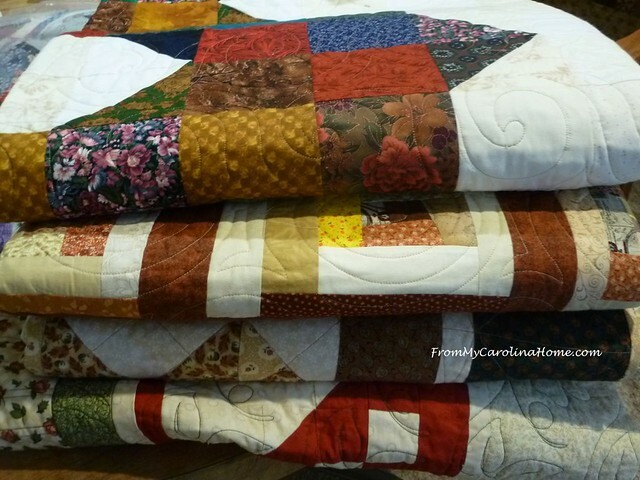 The Sandhill Quilters are having their members bring quilts to their December 11 luncheon, what a great idea!! I can’t wait to see how many quilts are collected, and pictures of that exchange!! 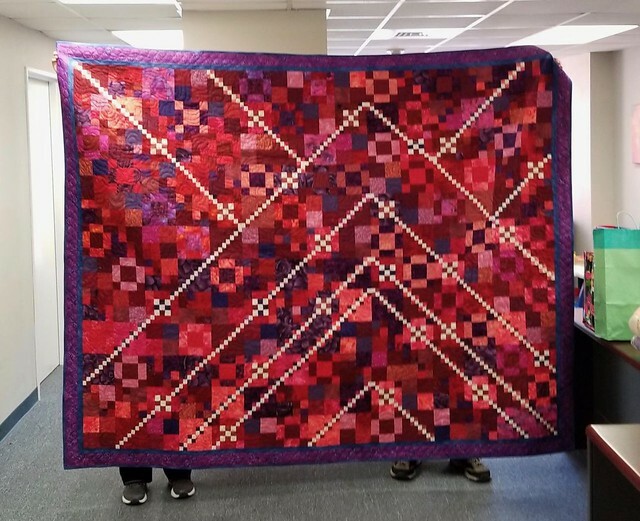 The Ashe County Quilters have engaged me as their program speaker for March 14, 2019, and I’ll be picking up their quilts for our project. I cannot wait to see how many they have! I’ll present my Decisions, Decisions program to them in West Jefferson, NC. What a great idea, a win-win for all of us!! Once again, if you have a blog, here is a button for your sidebar if you’d like to help spread the word on our project. The URL of the first post is underneath, and has been updated this week. 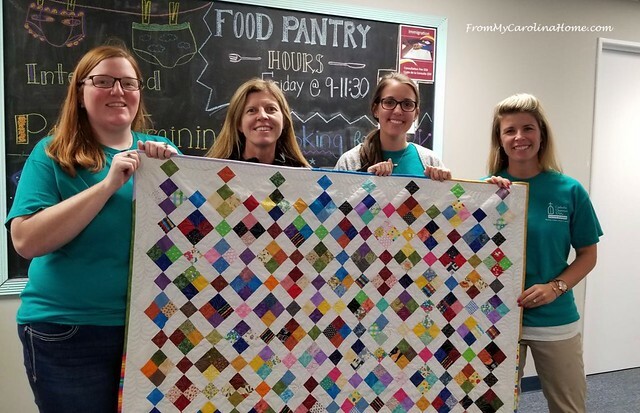 Whether you are making a quilt specifically for this drive, or you have one finished and sitting on a shelf in your home, all quilts welcome. 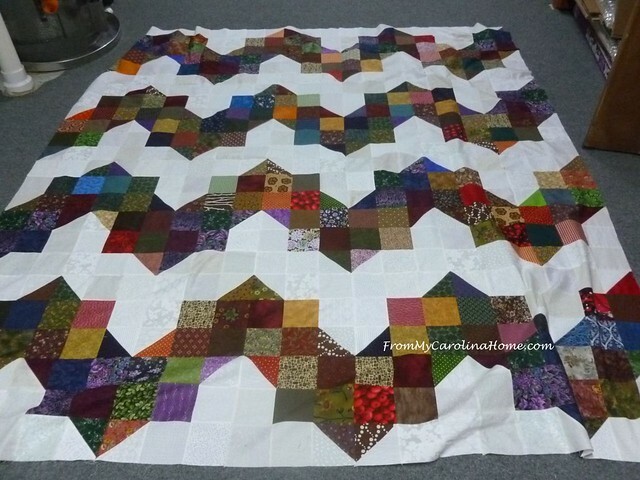 I’ll be pulling two or three quilts from my shelves for this project. 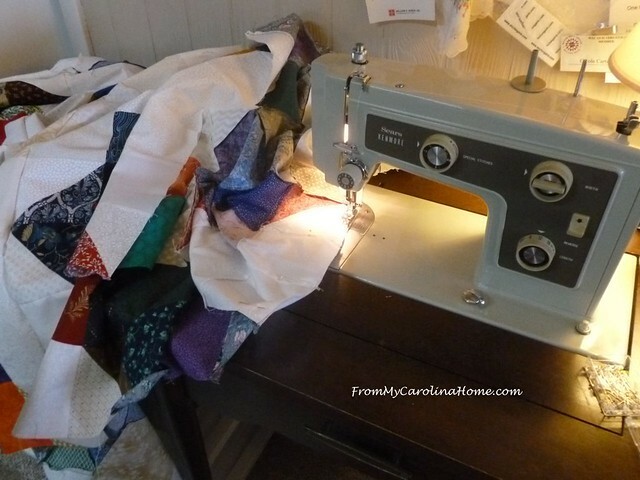 Do you have a quilt just sitting that you could part with for someone who lost everything? If you use a tyvek envelope for shipping, it greatly reduces the weight, and most quilts will ship for under $20, or maybe even less at both UPS and the post office. I save the tyveks that I get from ordering clothes online. One caveat, don’t put ‘quilt’ on the label anywhere, call it a blanket. (update – sharp eyes Barbara spotted the discrepancy for the label, so we’ll take the word ‘quilt’ out to reduce the chance of theft. Thanks, Barbara!) Shipping Address for Completed Quilts Only! Then, I got another message from Jo-El, three more quilts have arrived! This one is from Fran Miller in Virginia. and this stunningly beautiful Trip Around the World in purples and blues with a snowball border. Thank you ladies!! Hearts with Hands will be taking the first shipment when we get a carload full. A truck load would be even better! So, do you have a quilt just sitting on your shelf you can donate? Can you drop one off at Beginnings? Can you make one and send it? 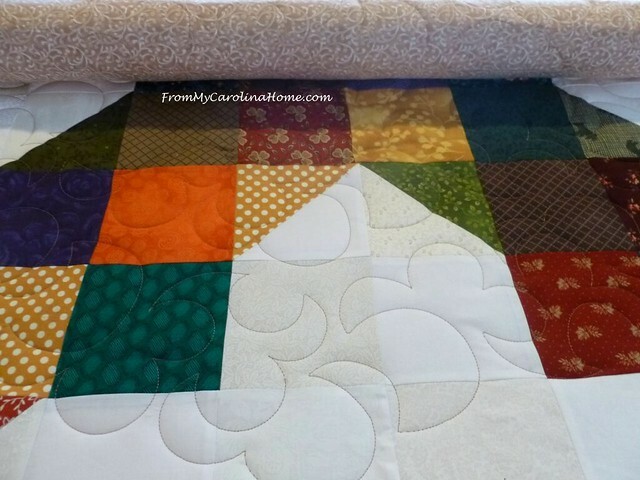 Do you need a longarmer to help you finish a quilt? Has your guild taken up the challenge? They look wonderful. So glad you had such a positive response. I have the blocks made by my Queen Bee members “webbed” together and 4 rows finished. Ran out of time during our bee this week, but hoping to get it together before our next gathering. One of the Queen Bee members has agreed to quilt it after the holidays. I found a nice large piece for backing in our 2nd Time Around stash! Win win all around. I’ve got a few extra blocks, so you never know what will happen after Christmas. What a heart-warming post on this chilly morning. 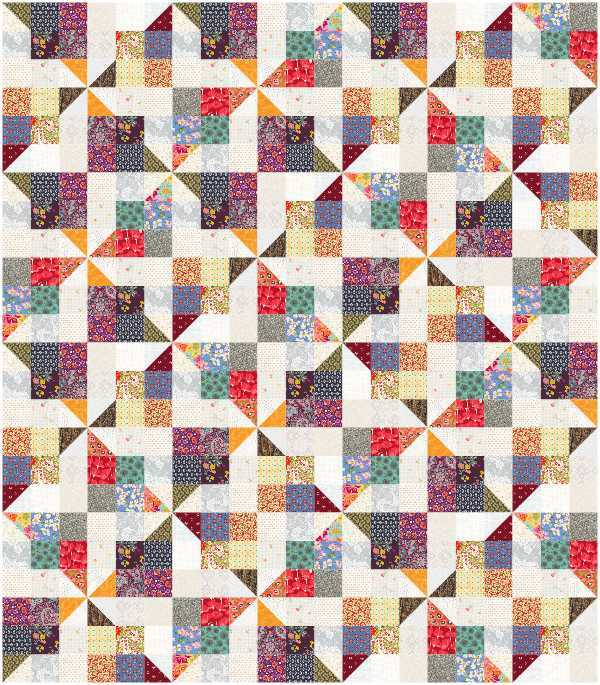 All of the quilts look great and i love how blocks from everywhere can come together and make something beautiful! Thanks for the update. Looks like the project is moving along nicely. A big thank you to all the quilters who have joined you in this effort. Just beautiful Carole. I posted to Facebook and I will bring it up again with the Guild. I put the call for blocks out to our group, so I’m hoping I get enough for at least one quilt. I assume this will be an ongoing need, so if I don’t get the blocks until January there’s still time to complete and send the quilt? Thanks for the update! It’s so wonderful to see the quilts arriving and being readied for gifting. 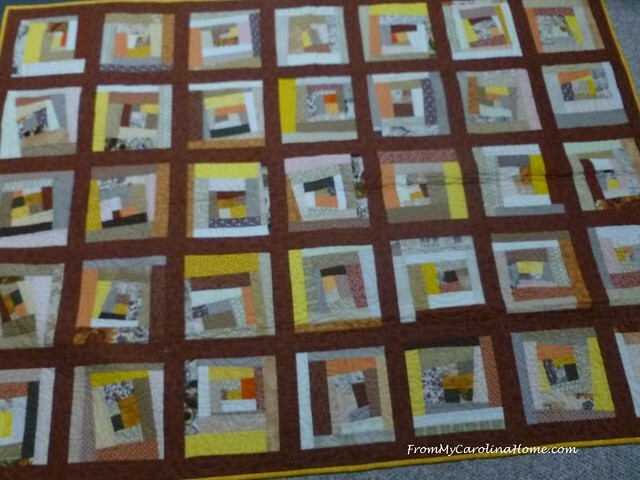 I’m finishing the binding today on the child’s version of this quilt and will send it off to Wilmington. Thank you for rallying us all for such a worthy cause. How awesome that the project is gaining momentum. Thank you for all your work to organize the effort! Such an inspiring update!!! How rewarding to see your project expand and reach so many!! Congrats on making such a big difference. Hello Carole, This post is so uplifting knowing all of these lovely quilts and future quilts are going to be helping so many people. Quilters are fantastic caring people! Thank you for all that you have done to begin this project and everyone who is helping it continue. I also read your interview on the Fat Quarter blog and it was fabulous and you are amazing! Your efforts are truly amazing! Yay for Quilters! Energy is pouring off your post. =) I mailed out two battings, full and queen to you earlier this week. They should be there soon. I really had to cram them in the box, and I taped it to death! 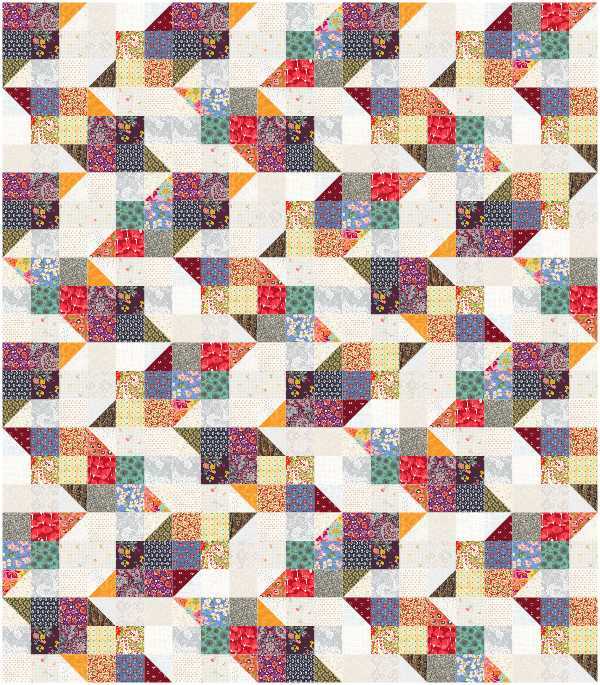 QD 100% natural cotton – quilting up to 8 inches apart is good. I’m posting your site on my first Advent message, too. Aren’t quilters the best people??? Beautiful quilts being sent in. I loved reading this. What a nice day to finish up this quilt with friends. My sister has a kenmore like this. Thanks so much for being an intermediary during this crazy time. My heart feels good knowing they will keep someone warm. Thank you for helping me pull this off. I think tomorrow will start my daughter’s and my retreat and we both are hoping to get some serious sewing done. Son-in-law is on the boat doing his thing while we laugh and consult over techniques and projects we have to work on. I hope you have a wonderful Christmas and a very happy New Year. Keep on blogging ok? I so enjoy reading it. Thanks again for all your help. I have a quilt top I would like to donate but it is NOT quilted. 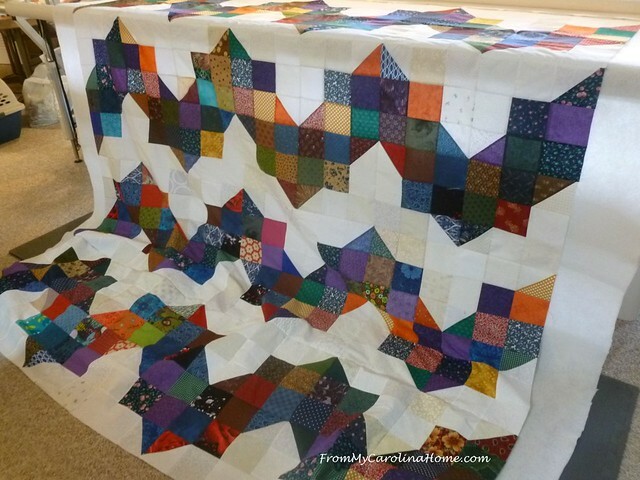 Do you know any long arm quilter who will volunteer to complete the work? I can mail it to the individual. 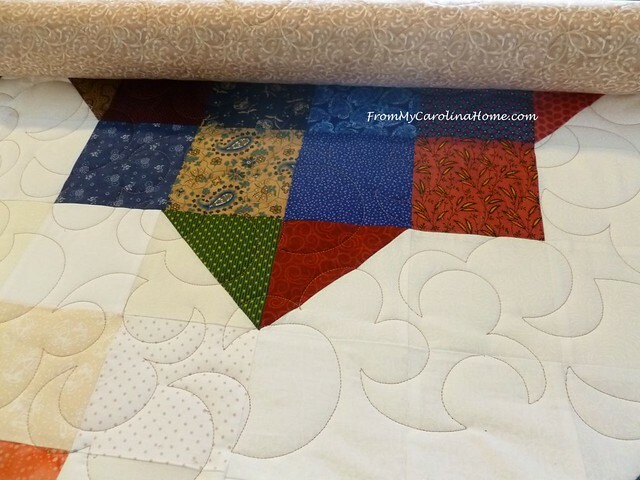 Please fill out the Quilter Needs Longarm services form linked on the latest post to be matched to a longarm quilter. You can always find the most recent information by clicking on the button on the sidebar.